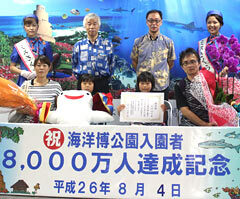 On August 4, Haruka Yatou (the second from right in front) was welcomed as the 80 millionth visitors with her family members at the Ocean Expo Park in Motobu. The Ocean Expo Park opened on August 1, 1976. It welcomed its 70 millionth visitor in 1978. Since then, it hosted 80 millionth visitor in two years and seven months.